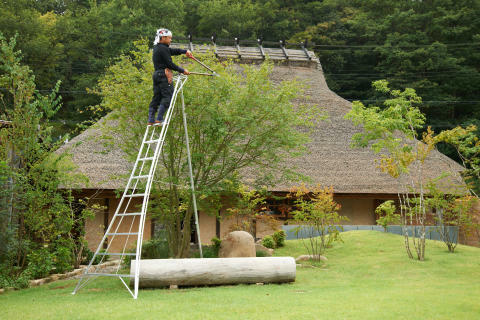 A Japanese tripod ladder that is specially designed for the garden industry has won the 2018 Elmia Garden Award for the year’s best garden product. The tripod ladder is both stable and durable and attracted great interest when it was first presented to the Swedish market. The tripod ladder’s front legs are telescopic and can be extended and adjusted depending on the ground conditions, so it can be adapted to a slope. The ladder is easy to move around and place so that you get close to trees and hedges without having to lean the ladder against them. Each step of the ladder has double rungs and the angle of the steps can be adjusted so the ladder resembles an ordinary staircase. This makes it easy for gardeners to hold their tools in their hands. The tripod ladder has been made for more than 50 years in Japan, so it is an old product that has been developed over the years, but it has not previously existed in Sweden. ARS – Nakaya Scandinavia AB began importing it first as a secret trial but the photos were immediately spread on social media and led to greater demand, including from arborist companies and training centres in the garden industry. In the summer of 2017 the distributor began importing the product on a larger scale. The tripod ladder is available in Sweden in four lengths, which are EU approved for professional use. The ladder was presented to the Swedish and Nordic market for the first time at Elmia Park and Elmia Garden 2017. The Japanese tripod ladder is new on the Swedish market. With a well thought-out design it is suitable for garden work. It is durable and stable even when standing on uneven ground, which creates a safer work environment, and it can be easily adjusted. 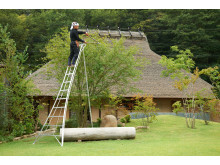 The Japanese tripod ladder is made of aluminium and is therefore easy to move. The Elmia Garden Award jury consists of Christina Säll, editor-in-chief of the magazine Hemträdgården, Simon Irvine, garden designer at Läckö Castle, and Magnus Åström, creative director at Blink. This year’s shortlisted products were presented for the first time at the Elmia Garden fair in 2017. What will be next year’s best innovation for the garden? Five smart, innovative products have been shortlisted for the Elmia Garden Award for garden product of the year for 2018. They are being exhibited for the first time at Elmia Garden in Jönköping, Sweden.